It has been a funny old month, the weather lurching from cold to boiling and then back again to cold and rainy. Today I overheard my Master asking where his woolly hat was, the Mistress had put it away in anticipation of the Summer arriving ! The family caravan has just had its annual servicing, so paws crossed we will be off on an adventure soon. I love positioning myself in a sunny spot by the front window watching the world go by once we are all pitched up. There are usually lots of dogs to check out and loads of exciting walks to explore the countryside. The Oil Pastel book has now gone to "lock down" thats a book publishing term meaning the books going to final print, looking forward to December when its on general release. As I have mentioned a few times there is much excitement for me as I am the model in the painting an animal chapter. When the book is out I will showcase my "Pawtrait" as it`s a secret until the book is printed. The Fisher household has once again gone into homegrown vegetable mode, the conservatory is a temporary greenhouse and seedings are appearing everywhere. I really hope theres lots of carrots, my owners cannot believe I have the ability to distinguish a carrot being peeled and whoosh… I'm there waiting ! Our front garden is our vegetable plot, all nicely designed artistically in a Piet Mondrian style, as you would expect from having an artist/gardener owner. The back garden is due for a revamp around the pond area, it will be nice to sit in a sunny spot and watch all the humans hard work taking place. There was a slight mishap involving the pond a couple of days ago, theres a large bay tree at the back and a pair of wood pigeons have nested in there. Well, to cut a long story short…. I always like to race outside when they fly in… unfortunately I dashed outside, looking up and ran across the middle of the pond !! 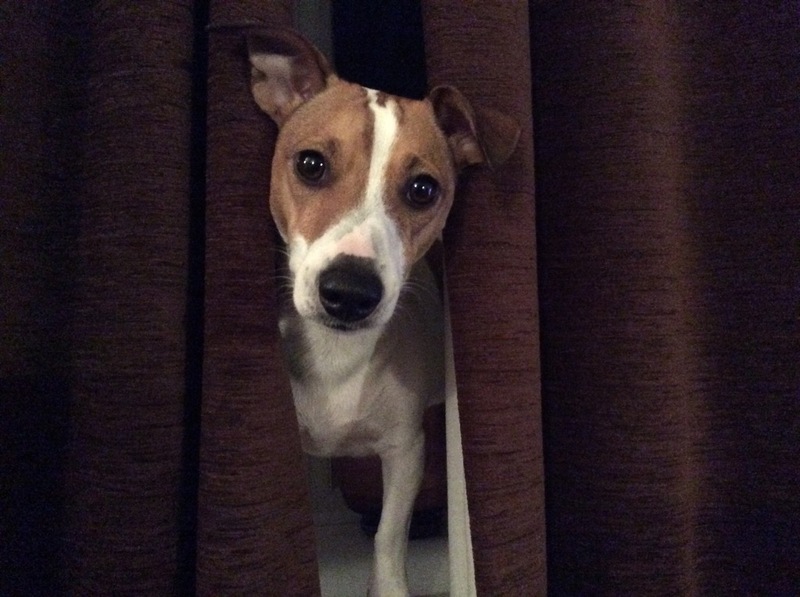 I can assure you that Parson Jack Russell Terriers cannot walk on water, I made my way to my Mistress dripping wet and feeling stupid. The pigeons are still laughing at me every time I visit the garden. The Master has just returned from tutoring a weekend sketching workshop at The Old House Studio, Torside, Derbyshire, he really enjoyed it and is looking forward to a two day acrylic workshop there on 22 & 23 September. I kept my Mistress company at home over the weekend, she was very busy on the office computer doing the end of year accounts. Its good up in the office, there is a chair positioned nicely by the window, so I can either snooze or use it as a vantage point to keep a canine eye on the street. The only problem is the local cats all know that I cannot get out and they parade past, tails in the air, much to my disgust. The Master is now really busy out and about on the road tutoring workshops and doing art demonstrations, I keep checking the diary hoping for a village venue so I can go along for the ride. Recently they have all been held in venues where doggies are not allowed. Right that is all for now, its turned cool here at the computer, my fleece blanket is calling and heres hoping the log burner gets lit soon… well it is nearly May. 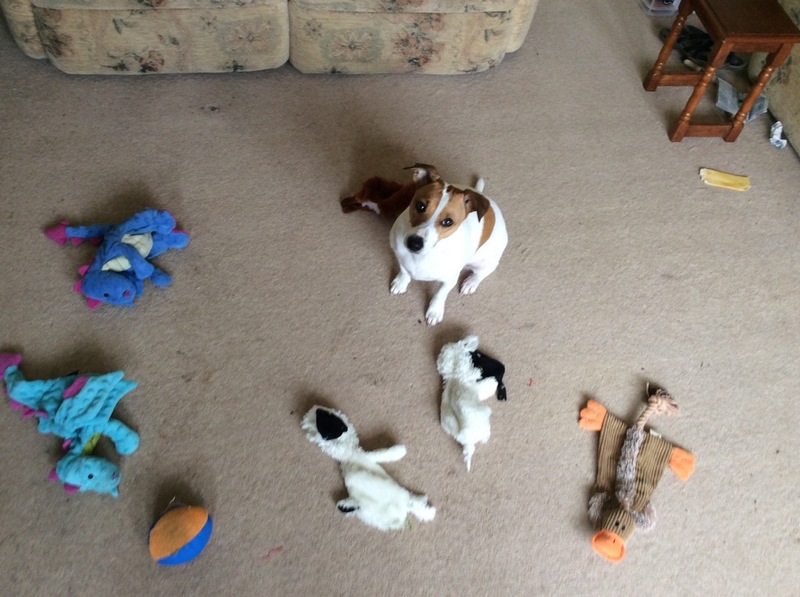 Here is a photo of me displaying the assortment of toys, some rather the worse for wear… a bit like the toys that Paddy the spaniel of "Max and Paddy out in the Lake District on Facebook" destroys. There is a recent photo of him with a very sad looking Telly Tubby ! The two dogs have over 67 thousand followers, maybe I should have my own Facebook page ?